Today, we are delighted to share an endorsement from Wouter Sleijffers, CEO of Fnatic — one of the world’s largest and most successful esports organisations — and a chiliZ advisor. With over a decade of big wins, the Fnatic team is at the forefront of the esports industry. At its core, are Fnatic’s talented professional gamers, who have won thousands of tournaments in every corner of the globe, and have inspired a community of tens of millions of fans. Fnatic attend more than 75 international events per every year, across 20 different games including League of Legends, Dota 2, Battlefield 4 and CS:GO. Wouter Sleijffers: “In the past few years we’ve been approached by numerous aspiring team owners, team managers and pro-gamers. You might be one of them. The question being ‘where do I start?’ It’s a difficult questions given how the industry has evolved already. Today, it requires significant resources to be on the top. And even for smaller leagues, you likely have a long and insecure path to walk. 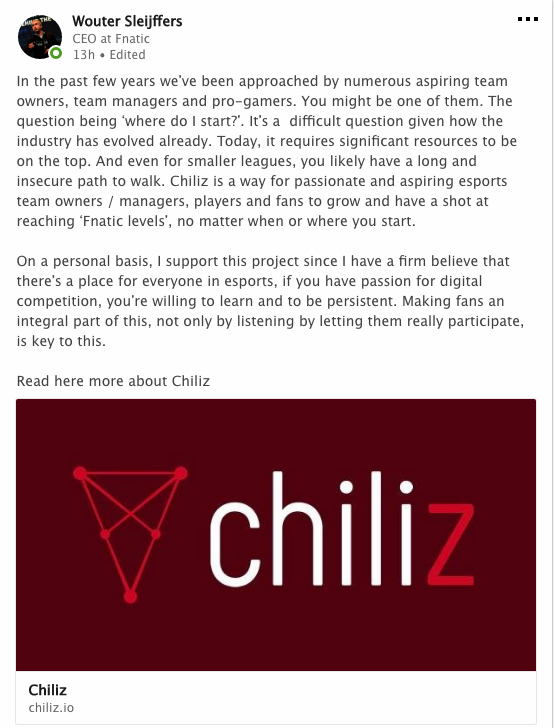 chiliZ is a way for passionate and aspiring esports team owners / managers, players and fans to grow and have a shot at reaching ‘Fnatic’ levels, no matter when or where you start. On a personal basis, I support this project since I have a firm belief that there’s a place for everyone in esports, if you have passion for digital competition, you’re willing to learn and to be persistent. Making fans an integral part of this, not only by listening but by letting them really participate, is key to this.